God of Carnage is a tightly wound, intense, darkly hilarious four-person play about what happens when our baser natures come to the surface. 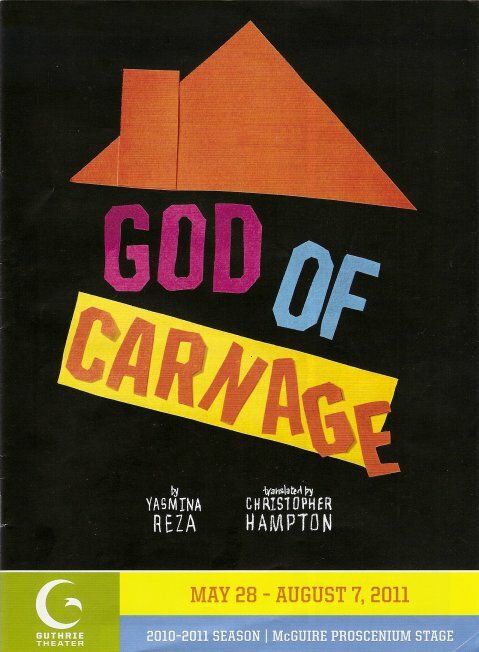 Written by French playwright Yasmina Reza and translated by Christopher Hampton, it won the Tony award for best play in 2009. It starts out as a very civilized conversation between two sets of parents. Annette and Alan's son hit Veronica and Michael's son with a stick, so they decide to meet and discuss the issue. The polished surface very quickly wears away as the situation devolves into tears (and other bodily fluids) and violence (mostly verbal but some physical as well). Sitting in the front row, I was afraid that someone or something would end up in my lap! In fact I believe a tulip did fly over my head at one point. So beware. I can't imagine the Broadway cast being any better than this cast of fabulous local actors assembled by the Guthrie. Tracey Maloney and Bill McCallum play Annette and Alan; Jennifer Blagen and Chris Carlson play Veronica and Michael. (Three of the four actors - Tracey, Bill, and Chris - were in Circle Mirror Transformation at the Guthrie Studio last year, one of my favorite shows of the year.) All four of them have their moments when they really get to break loose and go crazy. Alan's a jerk from the beginning, continually answering his cell phone in the middle of the conversation to have loud business discussions, implying that he's better and more important than everyone else. His wife Annette holds it all in, until she no longer can. A little rum helps loosen everyone up to speak freely about their marriages and children. Michael admits he's a "Neanderthal" (and hamster killer), while Veronica clings to the idea that there's still civilization and order in the world. But even she breaks down by the end. I kept wondering how this short one-act play was going to end, how they were going to resolve the situation. But there is no resolution, no ending. Everyone just collapses on the furniture in Veronica and Michael's once neat and precise living room, exhausted and defeated. It no longer seems shocking that one 11-year-old boy hit another one in the face with a stick, considering the world they come from, the world we all come from. The audience is left exhausted from laughter, and wondering what lies beneath the civilized surface of our own lives.